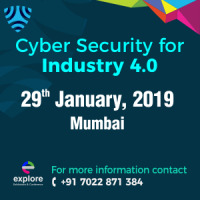 I am pleased to inform you that the agenda of our upcoming event Cyber Security for Industry 4.0 scheduled on 29th January 2019 Mumbai, India is ready and available for your reference. Explore more at http://www.exploreexhibitions.com/csfi4.0/ to learn more about the event. •	Mr. Radhakrishna Pillai- CIO, SRL Ranbaxy Ltd. The event addresses the most vital challenges and issues relating to Cyber Security. Not just theoretical approach but our events gives you the practical touch through Case Studies and Real Time Scenarios, Round Table Discussions, Breakout Sessions, Scheduled one – one Business meetings and lots of Networking opportunities. Are you ready to safeguard your company’s interest by keeping yourself upgraded to the next levelæ Or you are one of those companies which cater to cyber security solution for manufacturing plants then Join us at this most happening event of Cyber Security 2018.